As promised, this is part two of ‘taking your taco Tuesday to the next level’ and it’s all about the freshest tomato salsa. I suppose this could also be called pico de gallo, because I think they are pretty much the same thing. A small warning…making this will spoil you and jarred salsa from the store just won’t taste as good any more. I’m not so sure that’s a bad thing though, especially with how easy this salsa is to make! I received Joanna Gaines’ new cookbook the day it was released thanks to pre-ordering (slightly obsessed with all things Magnolia, happy to admit it!) and this is the first recipe I’ve tried from her collection! I had a little time to spend in the kitchen this past Saturday and with it being Cinco de Mayo the salsa recipe seemed fitting! One thing I love about this cookbook is the reading involved! Joanna wrote a great introduction to the book and tells a fun story with each recipe! They always seem to find a way to add a little extra touch and that’s one of the things I adore about Magnolia. The best part about this salsa recipe is using a blender/food processor which instantly makes life easier! My trusty Ninja food processor practically made this salsa for me! I chopped the vegetables into decent sized ‘chunks’ and let the processor do the rest. I did reserve one tomato, one jalapeno and a small portion of the red onion to finely chop with a knife and add at the end…partially for looks and partially because I like having some pieces without additional juices created from blending. Now, even though I happily admit to being obsessed with Magnolia I do have items I would and would not recommend so I’ll share a few of my favorites and a few that fell a little short. Let’s start with the good stuff. This Wood and Metal Wall Basket – I always have a vase of fresh flowers sitting in the basket and another piece of decor beside them like books. Great quality! Jimmy Don’s signs! I have this one and love it! They are sturdy, heavier than you’d expect and look great against the wall! Kitchen Towels, because they’re super cute! These aren’t the most absorbent towels, but they do work for their practical and decorative uses! All the candles! Okay, I haven’t actually tried this one yet, but absolutely love the Fall, Winter and Linen candles! The wood wicks are awesome and the candles burn evenly and last a while! Their faux herbs – I’m probably being picky on this one, but the stems didn’t match the realistic-ness (new word) of the leaves; I wasn’t a fan of the overall look. I will tell you though, they have fantastic customer service and dealing with returns or exchanges is a breeze! I’ve never had a better experience in that regard! Before we wrap this up I have to share the most exciting news at the moment….WE CLOSED OUR CONSTRUCTION LOAN!!! Getting to this point was no easy task and a couple times we thought we might not reach the finish line, but we did and it feels amazing! Check out our beautiful stick house below 🙂 It may not look like much right now, but it’s the outline of our future and forever home so right now those sticks mean everything to us! Let the building journey begin! And please don’t wait until Tuesday to make this salsa; Taco Thursday should exist right along with Taco Tuesday! Enjoy! 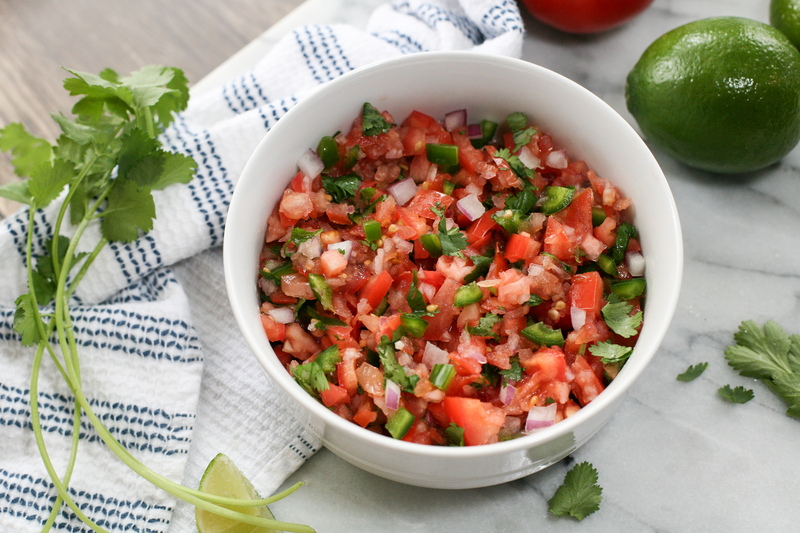 The perfect salsa for your chips and your tacos! Add onion to food processor and pulse to finely chop. Add tomatoes (leaving one for manually chopping, cilantro, one jalapeno and garlic. Pulse until well chopped. Stir in lime juice and salt. Pour into medium sized mixing bowl. Chop the remaining tomato and jalapeno with a knife and add to the mixing bowl. Add a few more cilantro leaves and toss gently. Serve with tortilla chips or use as a topping for tacos. Store in an airtight container in the refrigerator for up to 3 days. *I used a combination of vine and roma tomatoes for our salsa! This entry was posted in Recipe Book, Sides and tagged cilantro, easy salsa recipes, fresh tomato salsa, homemade salsa, mexican food, pico de gallo, pico de gallo recipes, salsa recipes, taco tuesday, tacos, tomato salsa. Bookmark the permalink.